As enterprise companies continue to expand their rapidly growing technology stacks, the need for an easy way to keep that data accessible across their entire company is an absolute must. Enterprise search software or search as a service provides a solution to this problem. With one search bar, an individual can search across dozens of different cloud platforms and access thousands of pages and types of content. So, What is Enterprise Search? Defined by Webopedia, Enterprise search is "an extensive search system that provides the means to search both structured and unstructured data sources with a single query. It addresses the needs of businesses that need to store, retrieve and track digital information of all kinds. Data sources in enterprise search systems includes information stored in many different containers such as e-mail servers, application databases, content management systems, file systems, intranet sites and external Web sites. Enterprise search systems provide users with fast query times and search results that are usually ranked in such a way that the information you need is easily accessible." Content is useless without access along with getting the right information at the right time. Enterprise search helps individuals in organizations seek the information they need from anywhere, in any format, from anywhere inside their company – in databases, document management systems, on paper, wherever. Many of the newer software platforms house their data in different clouds, making it next to impossible for an individual on his or her own to find the information they need from a single, simple search interface. For example a marketing team using a specific CRM will only see information available within that particular CRM database. Where else would they have to look? The ability to locate relevant information is something that users need to be able to do. While this is not a small task, online searching makes it easier to do. Searching is more than just typing something into a search box and getting a result. It’s more about discovering things about a topic that you didn’t necessarily know you were looking for. There are many different ways that you can optimize your data management so that documents and data become more accessible and easier to find. However, if someone needs to find specific content in a multitude of technologies, shares/storage and applications, he/she will probably end up searching in each application separately, trying to make the necessary correlations themselves. In this day of massive information growth this truly does present a problem, along with many wasted hours in searching. More and more companies today depend on innovation to maintain and ideally increase their competitiveness and productivity. The need is to provide employees one central access to all digital information – one single point of information access. How Does Enterprise Search Work? 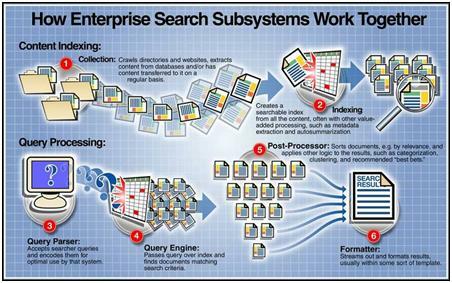 Firstly, in the back-end, Enterprise Search is made up of several sub-systems. A crawler will crawl all directories and websites, following the links between them and extracting the content from databases and other repositories. Then arranges for content to be transferred to it on a regular basis so it can set up notifications to the search engine when new information is available. A searchable index is then created, and other value-added processing, such as metadata extraction and auto-summarization, takes place. These functions will group information into logical categories that in turn can be searched and return results to users based on how the particular search engine has categorized them. An index is then created, queries can then be accepted, this can be in forms of terms or phrases that represent whatever you’re looking for, typed into the search box. At this point, the search engine processes the query by passing over the index, finding the relevant information that matches the particular term or phrases entered, and sends that information to some sort of document processor, which then sorts the information by relevancy or other measure, clusters it based on the categorization, applies some other logic. Lastly, it presents the results on the search results page. AI or predictive AI isn't the future of search, it is search. The best search technology out there already uses it to deliver accurate results. How does predictive AI work? Sifting through millions of search queries it identifies patterns within them, allowing the algorithm to serve better results from one user to the next. Those patterns are what ultimately allow predictive AI to autocomplete your thoughts before you’ve finished typing them into the search bar. In order for enterprise search software to successfully predict queries and help individuals discover information faster, it must deliver accurate results instantaneously. That’s just what people have come to expect from search. Enterprise search is complex and incorporates issues such as security, compliance and data classification. That complexity is further complicated by an enterprise itself, with the potential of different databases and data sources and so on. Tying all of those systems together in a way that enables useful information and retrieval requires careful preparation and forethought. Using a methodical process of evaluation can ensure that the right decisions can be made. So selecting the right Enterprise Search solution is essential and will help an organization facilitate finding specific documents, without the user having to sign into each system separately and search through it, by allowing a single access point to all information. Remember while every company is trying to increase productivity, the additional monetary expenditures for a new data management system may not seem attractive at first, the benefits by far outweigh the costs.